Ever since Barack Obama and Raúl Castro announced a diplomatic breakthrough in December, the reports have been steadily coming in. The number of Cubans picked up on the high seas is rising. Crossings at the U.S.-Mexico border too. According to the Miami New Times, 2,700 Cubans arrived in the city in the first three months of 2015, a two-hundred-percent increase over the year before. “Get out while you can,” seems to be such travelers’ thinking, lest islanders’ ability to procure green cards just one year after setting foot in the United States—made possible by the 1966 Cuban Adjustment Act (CAA)—go the way of travel and trade barriers already coming down. At the same time, calls for the Adjustment Act’s repeal are mounting. In January, longtime Cuba watcher Ann Louise Bardach argued in the New York Times that the policy’s Cold War logic no longer applies in an era of mending fences. More recently, the South Florida Sun-Sentinel followed suit, building upon a groundbreaking, if sensationalist series of articles documenting the credit card and insurance fraud schemes now flourishing under the cover of Cubans’ relative ease of movement between both shores. Meanwhile, the Cuban-American Republican establishment has long seen the movement of people, goods, and cash to and from the island as anathema to the political imaginary and project of exile, providing a “lifeline to the regime.” In fact, although the Cuban government has long opposed the Adjustment Act as an inhuman instigator to illegal migration, synergies between transnational flows and the island’s changing economy have raised suspicions in South Florida that the law is playing into Havana’s hands. Part of the blame, in critics’ view, rests with President Obama, who in 2009 lifted all prior executive branch restrictions on Cuban-Americans visiting family on the island. More recently, though, Cubans traveling home within two years of arriving in the United States—bringing in some of the estimated $5 billion in cash and in-kind remittances sent to Cuba annually—have been described as “abusing” the “refugee status” that the Adjustment Act purportedly confers. Worried that the American public has already started to see Cubans as just another group of “economic” rather than “political” migrants, undeserving of special privileges, local legislators, like national pundits, have begun debating what to do about the problem. And yet, in the course of such discussions, misconceptions about the CAA’s origins and purpose abound. The bullet-points that follow debunk some of the most frequently repeated fallacies about the Cuban Adjustment Act and U.S. migration policy toward Cubans generally. Importantly, they also expose proposals to modify rather than eliminate the law—like a recent initiative suggested by Congressman Carlos Curbelo—as political grandstanding more than sound policy. The CAA, in its origins, did not confer “refugee” or “exile status.” Never has, never will. At the time the Cuban Adjustment Act was passed, “refugee” and certainly “exile” were less legal terms of art than politicized vernacular. Cubans were “refugees” in so far as U.S. law defined the term as those fleeing communism. Yet before the Refugee Act of 1980, there was no “refugee” or “exile status” in U.S. immigration law per se. Those deemed “refugees” prior to this date—whether in common parlance or as beneficiaries of government institutions like the “Cuban Refugee Center” (created in 1961)—entered the United States under “parole.” Such provisional waivers for entry were and continue to be granted at the special discretion of the Attorney General. According to longstanding international law, by contrast, a “refugee” properly categorized as such is given permanent welcome, according to the principle of non-refoulement. 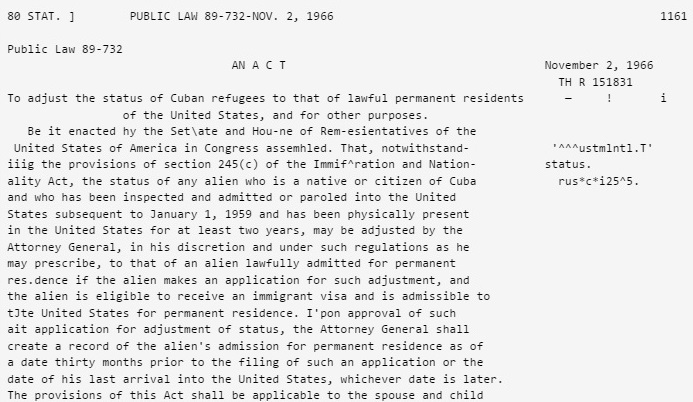 In truth, rather than codify a Cuban exile or refugee legal identity, the Cuban Adjustment Act came about as a response to a mundane administrative problem. By the mid-1960s, tens of thousands of island citizens had relocated to the United States under varying circumstances of duress. Some entered with tourist or student visas. Yet others arrived with “visa waivers” as the United States both extended a blanket welcome to those fleeing the Castro government’s designs and sought to use the demonstration effect of a sustained exodus to score anti-Fidel points. After the Bay of Pigs invasion and other anti-Castro initiatives failed, the hope of a quick homecoming disappeared. Thus, U.S. authorities devised a system by which those Cubans already in the United States could regularize (“adjust,” in legal jargon) their status without traveling home to request a formal entry visa—clearly not an option in the circumstances. In this way, Cuban-American politicians’ criticisms of ongoing “manipulations” of the CAA perpetuate a basic misreading of the law’s function. “I don’t criticize anyone who wants to go visit their [sic] mom or dad or their [sic] dying brother or sister in Cuba,” Senator Marco Rubio said in 2013. “But I am telling you it gets very difficult to justify someone’s status as an exile and refugee when a year and a half after they get here they are flying back to that country over and over again.” In this formulation, the CAA would seem to place Cuban migrants in a special category endangered by those beneficiaries “exploiting” the law’s benefits. Yet in fact the statute itself did nothing to legislate a binding legal designation (“refugee”) or moral imperative that would limit travel home in the future. Neither are those Cubans using the CAA today legally considered refugees. Unlike during the 1960s, today there is a special immigration procedure for refugees—defined as those suffering a “well founded fear of persecution based on…religion, political opinion, race, nationality, [or] membership in a particular social group.” According to State Department figures, Cuba continues to be one of the largest sources of refugees entering the United States in the world (4,205 in FY2013). Likewise, it is one of the few countries from which individuals can apply for refugee status directly. (Typically, “refugee” designates a foreign national that, having already fled his or her country of origin, is seeking entry to the United States from elsewhere.) Crucially, however, those accepted into the U.S. Refugee Admissions Program enter the United States already with an immigrant visa in hand and a guaranteed path to permanent residency after one year. The Adjustment Act, in other words, is completely irrelevant in such cases. By contrast, most of the 30,000-plus Cubans who immigrate to the United States each year and avail themselves of the CAA do so by following one of two paths. The first involves strategically applying for “asylum” upon arriving in the United States, albeit without much expectation of actually being granted such a status. Asylum seekers, as distinct from refugees, are those who request permanent admission at or within U.S. borders (that is, not from abroad) to escape conditions of political, religious, and/or other forms of persecution in their home countries. Cubans may do so at any U.S. port of entry—e.g. the Mexican border, a Coast Guard office, or an airport to which they might arrive with a non-immigrant visa. Formally, only thirty or forty Cuban asylum cases are approved each year. In practice, however, the point is moot, as asylum applicants, per the “Wet Foot/Dry Foot Policy” dating to the Clinton administration, are conceded at least a one-year, often extendable parole, after which they adjust their status under the CAA rather than wait for the resolution of their asylum cases. The second path is that followed by emigrants arriving with proper immigration documentation obtained at the U.S. consulate in Havana. Such individuals typically arrive directly from Cuba via charter flights. Some enter with proper immigration visas and do not need to adjust their status under the CAA. Others, however, come as parolees. Under migration accords signed with the Cuban government in the wake of the rafter crisis of 1994, the United States is obligated to approve a floor of 20,000 “legal travel documents” per year to help dissuade more dangerous forms of travel and/or a future migration emergency. However, because the procedure for applying for a regular immigrant visa is a lengthy one, U.S. officials have developed workarounds like the Cuban Family Reunification Parole Program (2007), which allows Cubans into the United States via parole before a formal immigrant visa has been approved. In this fashion, the State Department now ironically relies on the mechanism of parole and the CAA not only to regularize irregular migrants but to help facilitate the orderly, legal migration of Cubans to which the United States is committed by international agreement. Either way, once asylum seekers and other parolees adjust their status under the CAA, they become legal permanent residents (LPRs)—immigrants, just like those who enter with formal immigrant visas. Once again, nothing about the CAA prohibits infinite return visits to their country of origin. Only the Treasury Department’s Cuban Assets Control Regulations, tightened by the Bush administration in 2004 and subsequently liberalized by Obama in 2009, have had the legal authority to authorize or limit Cuban-American travel to the island over the years. Proposals to modify the law without eliminating it hide ulterior motives. Given this legal and policy labyrinth, most proposals to change the Adjustment Act without abolishing it completely tend to be built on partisan objectives masquerading as clear-cut legal principle. Most recently, Congressman Carlos Curbelo has proposed requiring all CAA petitioners to “attest that they are political refugees” in a signed declaration. Following in the footsteps of his predecessor David Rivera, Curbelo would also bar CAA beneficiaries from returning to the island to visit before they are U.S. citizens (in five years). Conceptually, Curbelo’s plan should be a non-starter. U.S. refugee laws are already on the books. The criteria for receiving this status is clear, and those that do, as stated above, are eligible for admission under the U.S. Refugee Admissions Program. In theory, to preserve the Adjustment Act as only a tool for “true refugees” would be to duplicate the work that the Refugee Admissions Program is already or could be doing. Curbelo might insist that those seeking a fast track to residency apply for formal refugee status and ditch the Adjustment Act altogether. Yet given Havana’s longstanding public opposition to what it still calls the Ley Asesina, no right-minded Cuban-American politician wants to be seen taking the same side of an argument as Cuban officials. In these ways, Curbelo’s proposal does not “protect the integrity” of the Cuban Adjustment Act or U.S. immigration law generally, as he claims. Instead, it molds the law’s use to the ends of a pro-sanctions/pro-isolation Cuban-American camp that has seen its political capital decline. Cubans would still automatically be allowed into the country, skipping the rigorous refugee and asylum procedures other nationalities face. Curbelo’s plan, however, would cripple the transnational networks that have already proven critical to helping an incipient Cuban private sector grow and expand. More perversely, it would once again hitch the condition of “exile”—in so far as average migrants might still identify with the term—to travel restrictions emanating from Washington as much as Havana. Despite mounting opposition and calls for reform, the Adjustment Act is likely not going anywhere soon. Washington may see the law as a guarantor of stability as both countries move toward a less confrontational relationship. Moreover, diasporic circuits the CAA makes possible are already promoting evolutionary change on the island, in line with White House strategy. Havana, too, despite continuing to officially oppose the statute, might in fact view it as a useful safety valve. In 2013, the Cuban government passed a significant Migration Reform that allows island citizens to reside abroad for up to twenty-four months without losing residency status, property, or business interests at home—longer, that is, than it takes to become eligible for permanent residency under the CAA. In this sense, Havana has effectively adopted an “if you can’t beat them, join them” strategy—making it easier for Cubans to get out, but also incentivizing the re-importation of capital, supplies, and know-how that they acquire abroad. Whichever way the debate goes, it is high time contenders meet the complexity of the issues head on. It remains easier to criticize Cubans’ skillful negotiation of the Adjustment Act as a “manipulation of the system” than admit that the system itself is prone to diverse uses. Likewise, advocates of repeal too often classify Cuban migrants today as mere financial animals instead of confronting the intertwined political and economic factors that continue influencing their decisions. This is not to say the special entry privileges extended to Cubans in the United States are easy to defend. Yet just as statements about the statute’s declining “integrity” mischaracterize its original purpose, critics of the law would be better suited pitching their arguments around principles of basic fairness vis-à-vis other immigrant groups rather than overly simplistic theories about the changing drivers of Cuban migration over time. In the interim, Cubans will continue ingeniously navigating existing legal regimes to forge transnational existences across political and geographic divides. And who can blame them. Recent arrivals have gone so far as to fashion an identity category all their own—not “immigrant,” “exile,” or “Cuban-American,” but “emigrant,” as if in a perpetual state of becoming. The Adjustment Act may have outlived its usefulness or justification. For the moment, however, Cubans’ border-bending appropriations of its legal potential deserve admiration as much as scorn. Michael J. Bustamante is a PhD candidate in History at Yale University. His forthcoming doctoral dissertation is entitled "Cuban Counterpoints: Memory Struggles in Revolution and Exile." Recent essays of his on Cuban and Latin American affairs have appeared in Foreign Affairs, Perspectives on History, NACLA Report on the Americas, Annals of the American Academy of Political and Social Science, Current History, Wilson Quarterly, Milken Institute Review, Espacio Laical (Cuba), VIA: Valors, Indees, Actituds (Spain), and Política Externa (Brazil).